A lucid treatment that takes on board shadow–banking, Dodd–Frank, the zero lower bound, and forward guidance. In short, all the key post–crisis issues. The financial sector is a vital component of the US economic machinery. The Federal Reserve works within this sector to promote its congressional mandates of maximum employment and low inflation. Unfortunately, the contribution of the financial system to the economy s performance is not well understood. Students of standard college courses on money, banking, and monetary policy often find that the textbooks have not kept pace with the evolution of the financial sector, including the rise of securitized finance and the Federal Reserve s evolving monetary operations. Tom Simpson s book represents a huge step forward in this regard. His comprehensive exposition of the essential parts of the financial system and modern explanation of how the Federal Reserve supports the economy gives readers a much better understanding of the US financial system and the Federal Reserve. James Glassman, Managing Director and Head Economist for the Commercial Bank, JPMorgan Chase & Co.
Financial Markets, Banking, and Monetary Policy by Tom Simpson provides a comprehensive introduction to the financial system, including the markets, institutions, and mechanisms of finance, as well as the role of the Federal Reserve and monetary policy. The economic principles underlying finance are woven through the chapters, and the book includes an insightful introduction into the causes of and responses to the recent financial crisis. 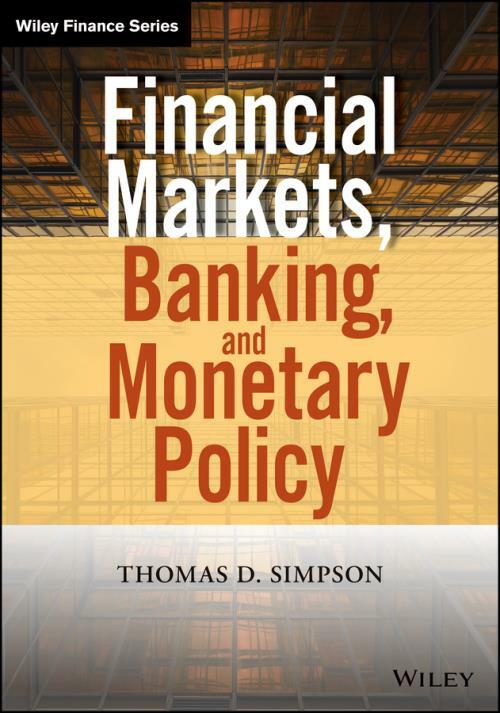 Tom Simpson has had a front–row seat on financial developments in recent decades and has written a book that provides an ideal introduction to the financial system and monetary policy.